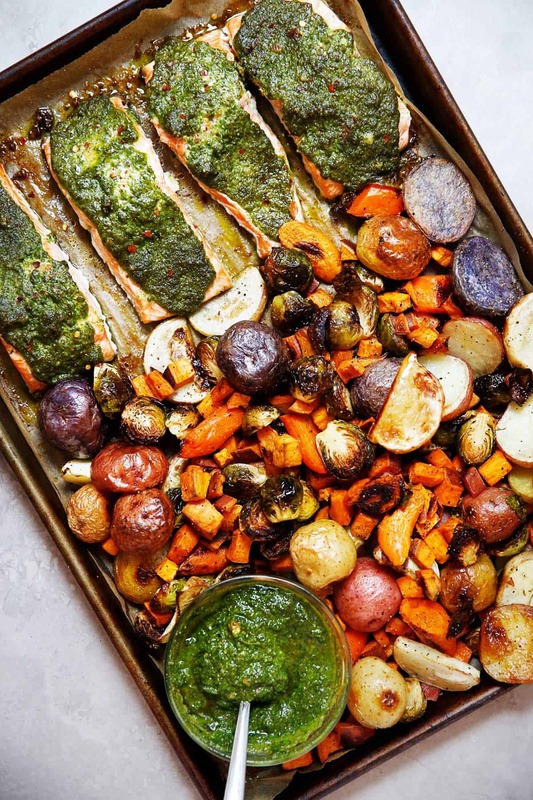 This Sheet Pan Root Vegetable and Sage Pesto Salmon recipe is the perfect dinner any night of the week! What I love about this sheet pan supper (other than the fact that cleanup is as easy as possible) is how versatile it is. In the summer, you can use fresh zucchini, bell peppers, and corn; in the fall and winter, root vegetables; and in the spring, asparagus, peas, and artichokes. The sage pesto is an awesome switch-up from the classic basil version, and I love how it pairs with the heartier root vegetables, but feel free to use basil in the warmer seasons. If you don’t love fish, use chicken breasts and bake for 25 to 30 minutes. 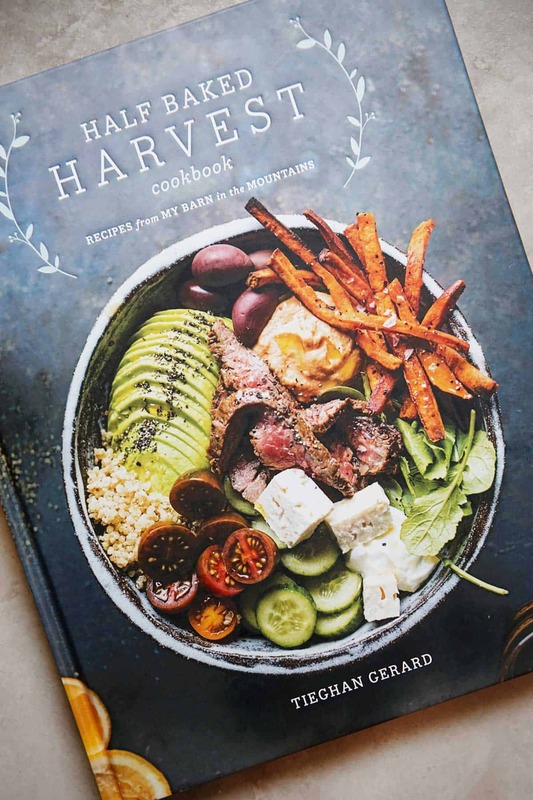 This recipes come to you from the Half Baked Harvest Cookbook, and to no surprise from Tieghan, it is a stunning cookbook filled with so many recipes, from her swoon-worthy barn in the mountains! While this cookbook isn’t totally gluten-free or paleo-friendly, it is 100% adaptable and FABULOUS. On my list of recipes to make: Salted Fig + Maple Butter + Tahini Toast, Buddha Smoothie Bowl, Quick Kickin’ Cajun Shrimp & Rice, Perfect Potato Soup with Crunchy Kale, Garlic Lemon Butter Shrimp, and so many more! 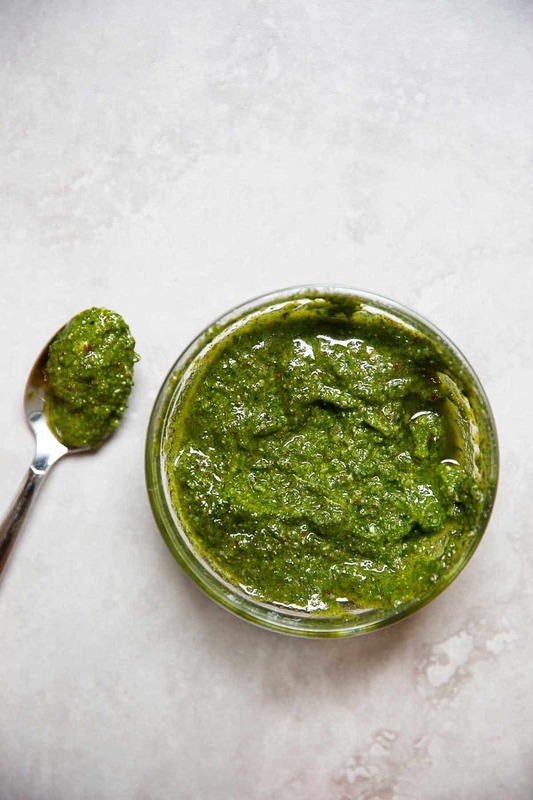 The perfect pesto! 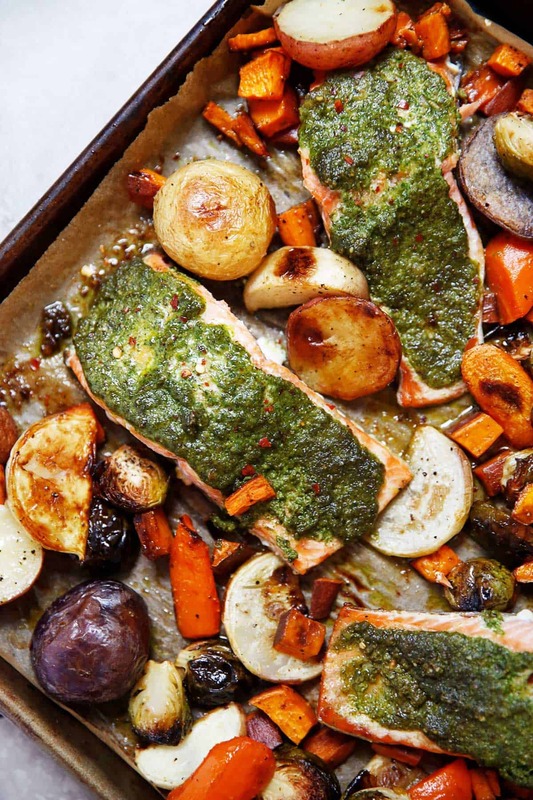 We just LOVE this sheet pan salmon dinner! On a rimmed baking sheet, toss the beets, carrots, sweet potatoes, baby potatoes, and Brussels sprouts with the olive oil. Season with salt and black pepper. Roast for about 20 minutes, or until the veggies are slightly tender. MEANWHILE, MAKE THE PESTO. In a food processor, combine the sage, kale, and pistachios and pulse until finely chopped. Add the Parmesan, if adding, and pulse again. With the motor running, drizzle in the olive oil. Season with salt and red pepper flakes. Remove the veggies from the oven and push them to one side of the pan. Put the salmon on the other side. Rub a few tablespoons of the sage pesto over each fillet. Return the pan to the oven and roast for 10 to 20 minutes more, until the salmon reaches your desired doneness and the veggies are soft. If desired, squeeze a drop of lemon juice over the salmon. Serve with the roasted veggies and extra sage pesto alongside. This recipe is from my friend Tieghan's cookbook, Half Baked Harvest Cookbook, and printed with permission! Oh YES! this looks awesome and you just solved my dinner problems for tonight! What a perfect dinner idea! HOLY MOLY…This looks so tasty! What a fantastic sheet pan dinner! Perfect for busy weeknights! Looks so delicious! This looks so good! Can’t go wrong with a good, flavorful sheet pan dinner. I’m still dreaming about this dish- the tastiness and the ease of a one pan meal! The pesto was a slam dunk, absolutely delicious. What would the serving size for this dinner be? 2-4! Depending on how much salmon you use.